The abdomen is an anatomical area that is bounded by the lower margin of the ribs and diaphragm above, the pelvic bone (pubic ramus) below, and the flanks on each side. Although abdominal pain can arise from the tissues of the abdominal wall that surround the abdominal cavity (such as the skin and abdominal wall muscles), the term abdominal pain generally is used to describe pain originating from organs within the abdominal cavity. Organs of the abdomen include the stomach, small intestine, colon, liver, gallbladder, spleen, and pancreas. Abdominal pain can range in intensity from a mild stomach ache to severe acute pain. The pain is often nonspecific and can be caused by a variety of conditions. Abdominal pain is caused by inflammation (for example, appendicitis, diverticulitis, colitis), by stretching or distention of an organ (for example, obstruction of the intestine, blockage of a bile duct by gallstones, swelling of the liver with hepatitis), or by loss of the supply of blood to an organ (for example, ischemic colitis). To complicate matters, however, abdominal pain also can occur for unclear reasons without inflammation, distention, or loss of blood supply. An important example of this latter type of pain is the irritable bowel syndrome (IBS). These latter types of pain are often referred to as functional pain because no recognizable (visible) causes for the pain have been found. Information obtained by taking a patient's history is important in helping doctors determine the cause of pain. This includes the way the pain begins, its location, pattern, and duration. It also includes what makes the pain worse as well as what relieves it. Associated signs and symptoms, such as fever, diarrhea, or bleeding also are considered. When does the pain occur? Always? More often in the morning or at night? If the pain comes and goes, about how long does it last each time? Does it occur after eating certain types of foods or after drinking alcohol? During menstruation? 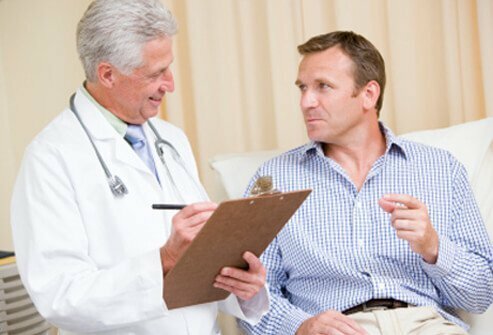 These are typical questions your doctor may ask that may help determine the cause. For example, abdominal pain that comes on suddenly may suggest a sudden event such as the interruption of the supply of blood to the colon (ischemia) or obstruction of the bile duct by a gallstone (biliary colic). Your doctor may ask: Is the pain throughout your abdomen or is it confined to a particular area? 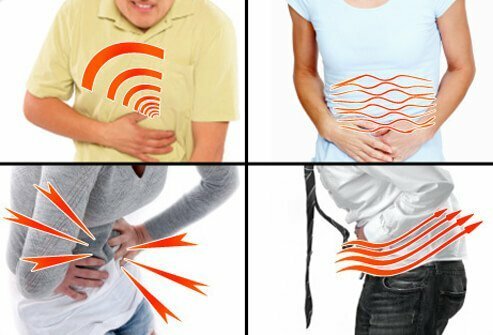 Where in your abdomen does the pain seem to be located? 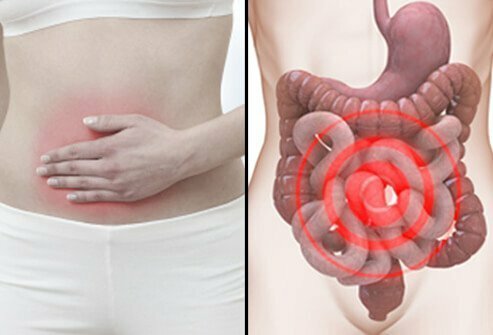 The location of the pain can help diagnose certain causes such as appendicitis, which typically causes pain in the middle of the abdomen, which then moves to the right lower abdomen, the usual location of the appendix. Diverticulitis typically causes pain in the left lower abdomen where most colonic diverticula are located. 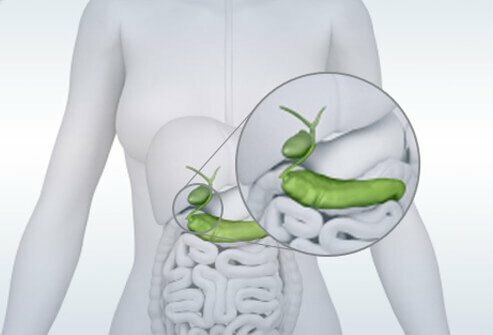 Pain from the gallbladder (biliary colic or cholecystitis) typically is felt in the middle, upper abdomen, or the right upper abdomen near where the gallbladder is located. What type of pain are you experiencing? Is it stabbing and severe? Is it a dull ache? Does the pain also radiate into your lower back, shoulder, groin, or buttocks? Patterns of pain can be helpful in diagnosis of abdominal pain. An obstruction of the intestine, for example, initially causes waves of crampy abdominal pain due to contractions of the intestinal muscles and distention of the intestine. True cramp-like pain suggests vigorous contractions of the intestines. Obstruction of the bile ducts by gallstones typically causes steady (constant) upper abdominal pain. Acute pancreatitis typically causes severe, unrelenting, steady pain in the upper abdomen and upper back. 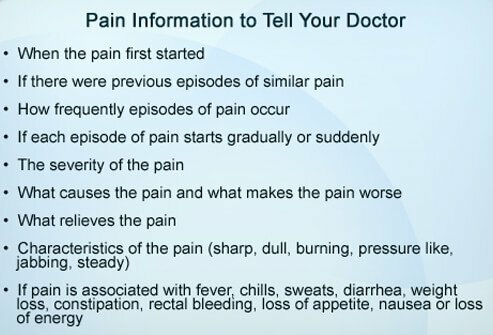 How long you have had the pain can help determine the cause. The pain of IBS, for instance, typically waxes and wanes over months or years and may last for years or decades. The pain of biliary colic lasts between 30 minutes and several hours, and pancreatitis pain lasts one or more days. Acid-related diseases such as gastroesophageal reflux disease (GERD) or duodenal ulcers typically show periodicity, that is, a period of weeks or months during which the pain is worse followed by periods of weeks or months during which the pain is better. Characteristics of the Pain - What Makes the Pain Worse? What were you doing when it started? Is the pain worse when you cough? Does it hurt for you to breathe? Pain due to inflammation (appendicitis, diverticulitis, cholecystitis, pancreatitis) typically is aggravated by sneezing, coughing, or any jarring motion. Patients with inflammation as the cause of their pain prefer to lie still. Characteristics of the Pain - What Relieves the Pain? Does any activity such as eating or lying on one side relieve the pain? Does staying in one place or moving around relieve the pain? Does throwing up make the pain better or worse? Actions and activities that provide relief can assist in diagnosis. The pain of IBS and constipation often is relieved temporarily by bowel movements and may be associated with changes in bowel habit. Pain due to obstruction of the stomach or upper small intestine may be relieved temporarily by vomiting which reduces the distention that is caused by the obstruction. Eating or taking antacids may temporarily relieve the pain of ulcers of the stomach or duodenum because both food and antacids neutralize (counter) the acid that is responsible for irritating the ulcers and causing the pain. Pain that awakens patients from sleep is more likely to be due to non-functional causes. Signs and symptoms can aid in identifying the cause of pain. The presence of fever suggests inflammation. Diarrhea or rectal bleeding suggests an intestinal cause of the pain. A fever and diarrhea suggest inflammation of the intestines that may be infectious or non-infectious (for example, ulcerative colitis or Crohn's disease). The presence of blood in the stool may signify an intestinal problem such as an ulcer, colon cancer, colitis, or ischemia. While the history and physical examination are vitally important in determining the cause of abdominal pain, testing often is necessary to determine the cause. These include laboratory tests, X-rays of the abdomen, radiographic studies, endoscopic procedures, and surgery. 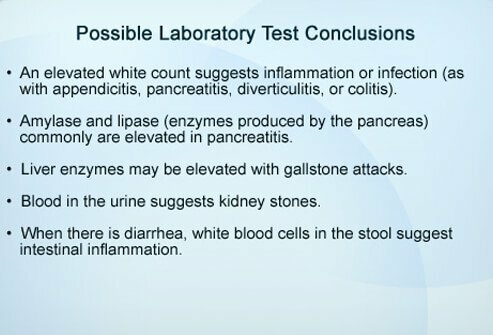 Laboratory tests such as the complete blood count (CBC), liver enzymes, pancreatic enzymes (amylase and lipase), and urinalysis are frequently performed in the evaluation of abdominal pain. 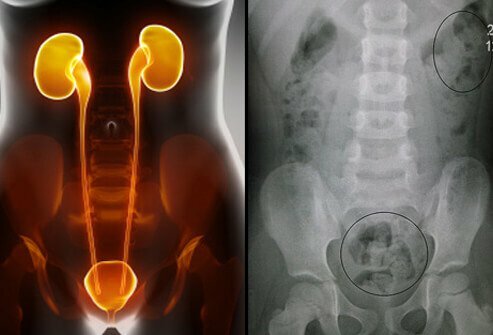 Plain X-rays of the abdomen also are referred to as a KUB (because they include the kidney, ureter, and bladder). The KUB may show enlarged loops of intestines filled with copious amounts of fluid and air when there is intestinal obstruction. Patients with a perforated ulcer may have air escape from the stomach into the abdominal cavity. The escaped air often can be seen on a KUB on the underside of the diaphragm. Sometimes a KUB may reveal a calcified kidney stone that has passed into the ureter and resulted in referred abdominal pain or calcifications in the pancreas that suggests chronic pancreatitis. Radiology studies of the patient's abdomen can be useful. 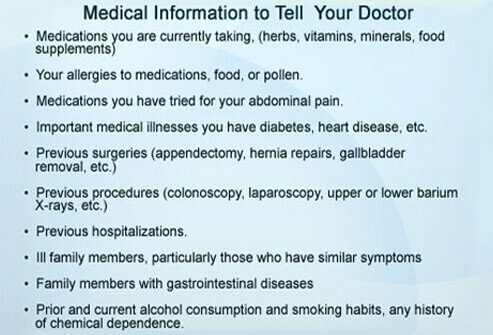 Your physician may perform one or any of the associated tests listed. 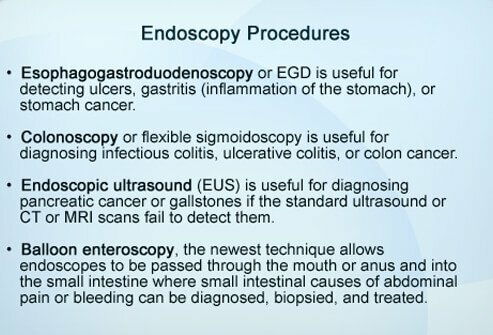 Endoscopy is the examination of the inside of the body (commonly the esophagus, stomach, and portions of the intestine) by using a lighted, flexible instrument called an endoscope. 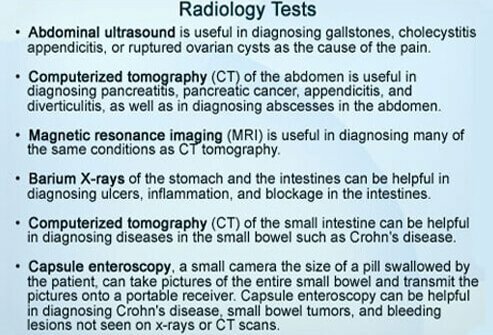 Examples of abdominal tests are listed on this slide. Sometimes, diagnosis requires examination of the abdominal cavity either by laparoscopy or surgery. Laparoscopy is a type of surgery in which small incisions are made in the abdominal wall through which a laparoscope and other instruments can be placed to permit structures within the abdomen and pelvis to be seen. 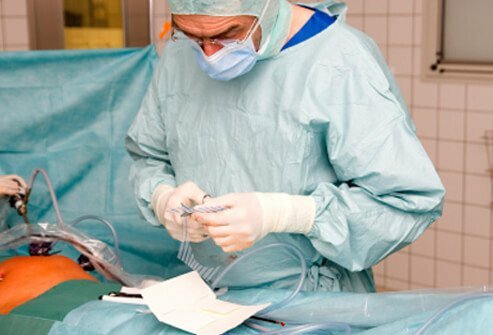 In this way, a number of surgical procedures can be performed without the need for a large surgical incision. Why Can Diagnosis of the Cause of Abdominal Pain Be Difficult? Modern advances in technology have greatly improved the accuracy, speed, and ease of establishing the cause of abdominal pain, but significant challenges remain. There are many reasons why diagnosing the cause of abdominal pain can be difficult. These are discussed on the following slides. For example, the pain of appendicitis sometimes is located in the right upper abdomen, and the pain of diverticulitis is on the right side. Elderly patients and patients taking corticosteroids may have little or no pain and tenderness when there is inflammation, for example, with cholecystitis or diverticulitis. This occurs because the elderly show fewer symptoms and signs of inflammation and corticosteroids reduce the inflammation. Ultrasound examinations can miss gallstones, particularly small ones. CT scans may fail to show pancreatic cancer, particularly small ones. The KUB can miss the signs of intestinal obstruction or stomach perforation. 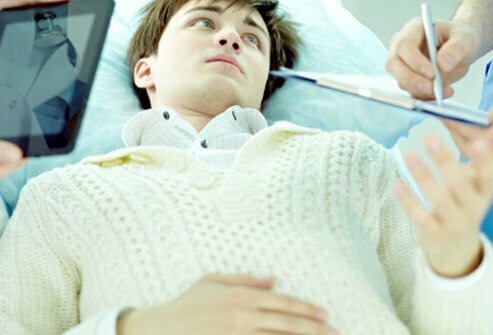 Ultrasounds and CT scans may fail to demonstrate appendicitis or even abscesses, particularly if the abscesses are small. The CBC and other blood tests may be normal despite severe infection or inflammation, particularly in patients receiving corticosteroids. IBS symptoms can mimic bowel obstruction, cancer, ulcer, gallbladder attacks, or even appendicitis. Crohn's disease can mimic appendicitis. Infection of the right kidney can mimic acute cholecystitis. A ruptured right ovarian cyst can mimic appendicitis; while a ruptured left ovarian cyst can mimic diverticulitis. Kidney stones can mimic appendicitis or diverticulitis. Examples discussed previously include the extension of the inflammation of pancreatitis to involve the entire abdomen and the progression of biliary colic to cholecystitis. How Can I Help My Doctor to Determine the Cause of My Abdominal Pain? Before the visit, prepare written lists to the questions shown. Answers to these questions can help the health care professional find the cause of the patient's pain more quickly and easily. In addition, have answers specifically related to the pain prepared for your doctor. Do not expect an instant cure or immediate diagnosis. Multiple office visits and tests are often necessary to establish the diagnosis and/or to exclude serious illnesses. Doctors may start you on a medication before a firm diagnosis is made. Your response (or lack of response) to that medication sometimes may provide your doctor with valuable clues as to the cause. Therefore, it is important for you to take the medication prescribed. Notify your doctor if your symptoms worsen, if medications are not working, or if you think you are having side effects. Do not self-medicate (including herbs, supplements) without discussing it with your doctor. 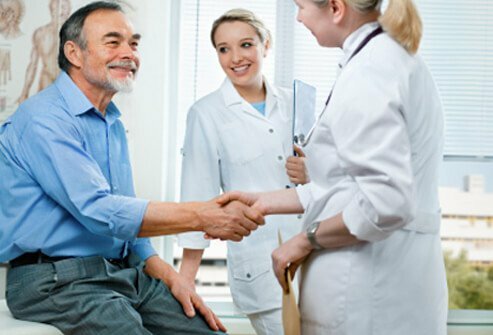 Even the best physician never bats 1000, so do not hesitate to openly discuss with your doctor referrals for second or third opinions if the diagnosis cannot be firmly established and the pain persists. Self-education is important, but make sure what you read comes from credible sources. MedTerms Medical Dictionary by MedicineNet, Inc.
© 2005 - 2013 WebMD, LLC. All rights reserved.